BTV: MAP Partnership Announcement - March 22, 2016 An exciting new partnership between the Melbourne Aviation Precinct and the Essendon Football Club. The Coaches have a new sponsor on board for 2016. Essendon Football Club would like to welcome Melbourne Aviation Precinct (MAP) as the Bombers Official Coaches Partner for the next three seasons. MAP is located at Melbourne Airport and offers a variety of services to businesses in the aviation sector, including aircraft Hangar and Apron Parking. CEO Xavier Campbell said the Club was proud to be partnering with a Melbourne business that’s on the rise. “I’d like to welcome Melbourne Aviation Precinct to the Essendon family,” Campbell said. “MAP is situated just over the back fence of the True Value Solar Centre, and it’s with great pleasure we welcome them as the new Official Coaches Partner for the next three seasons. MAP Managing Director Murray Rance believes the new deal lays the foundations for a long standing partnership with the Bombers. 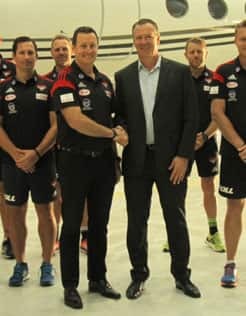 “Melbourne Aviation Precinct is delighted to partner the Essendon Football Club, and its team of Coaches led by John Worsfold,” Rance said. “MAP is a unique business precinct within the broader Melbourne Airport at Tullamarine providing aviation centric services and is a close neighbour of the Essendon Football Club. The new partnership will see the MAP logo take pride of place on the coaches’ apparel, match-day coaching boards and at the True Value Solar Centre.